When I manage to escape the lab, my interests include music and playing squash. I try and play squash against people I know as often as I can. I started playing whilst in high school and though not amazing at the sport I enjoy the challenge it offers. Playing a shot that is 'just' right is also extremely rewarding when it happens (never often enough somehow!). 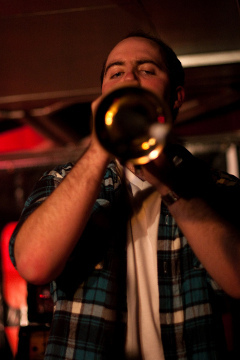 I also play trumpet and trombone, both for myself and as part of larger groups. I recently competed as part of the ska band Fourth Wave in the Battle of the Bands '10 competition run by the Band society at Warwick. Described as "...a party and everyone is invited" (Ruth Pearce, heat judge), we reached the semi-finals of the competition before being knocked out. We've since continued to play gigs around Coventry and Leamington Spa. Some of our material can be heard online here. My interest in ska music developed from wanting to listen to music that involved the instruments I played. I joined the punk society in my first week at Warwick as it covers the genre along with other punk subgenres. I'm now in my fourth year of helping run the society as the Head DJ which has seen me take roles in organising and promoting local gigs. This also involves a weekly radio show during term time playing a range of different types of tunes.